For this example the display has been changed to show midday across the middle of the timetable rather than midnight. It covers 24 hours vertically and 1 year horizontally. Apart from showing times of sunrise and sunset the display can show variation in solar altitude by time of day throughout the year. For a location like London the Sun doesn't get above 20 degrees in mid-winter and even in mid-summer barely gets over 60 degrees. The day width was changed from the usual 6 pixels to 1 pixel so that a year fits comfortably on one screen. For a location in the tropics the situation is very different. 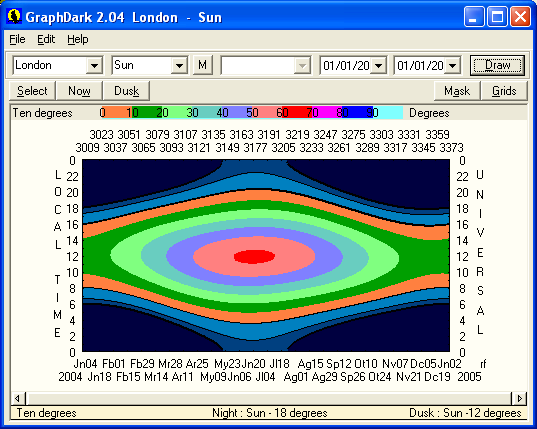 At some times of the year the Sun passes overhead at midday, at others it doesn't drop much below 50 degrees at midday.